When first published, Structural Geology broke new ground by offering a comprehensive, richly illustrated survey of the evolution of the earth’s outer layers, presented within the unifying context of structural and plate tectonics. Now this highly regarded text returns, in thoroughly updated new edition designed to show students how geologists interpret deformations in the earth’s crust as clues to the processes that are continually recasting the planet. 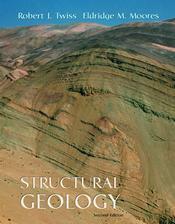 Instructors can download a zip file (47 mb) with the art from Structural Geology, Second Edition in jpeg format here.